Disco Distributed Filesystem (DDFS) provides a distributed storage layer for Disco. DDFS is designed specifically to support use cases that are typical for Disco and mapreduce in general: Storage and processing of massive amounts of immutable data. This makes it very suitable for storing, for instance: log data, large binary objects (photos, videos, indices), or incrementally collected raw data such as web crawls. In this sense, DDFS is complementary to traditional relational databases or distributed key-value stores, which often have difficulties in scaling to tera- or petabytes of bulk data. Although DDFS stands for Disco Distributed filesystem, it is not a general-purpose POSIX-compatible filesystem. Rather, it is a special purpose storage layer similar to the Google filesystem or related open-source projects such as Hadoop Distributed Filesystem (HDFS), MogileFS or Tabled. DDFS is a low-level component in the Disco stack, taking care of data distribution, replication, persistence, addressing and access. It does not provide a sophisticated query facility in itself but it is tightly integrated with Disco jobs. Disco can store job results to DDFS, providing persistence for and easy access to processed data. DDFS is a tag-based filesystem: Instead of having to organize data to directory hierarchies, you can tag sets of objects with arbitrary names and retrieve them later based on the given tags. For instance, tags can be used to timestamp different versions of data, or denote the source or owner of data. Tags can contain links to other tags, and data can be referred to by multiple tags; tags hence form a network or a directed graph of metadata. This provides a flexible way to manage terabytes of data assets. DDFS also provides a mechanism to store arbitrary attributes with the tags, for instance, to denote data type. DDFS is schema-free, so you can use it to store arbitrary, non-normalized data. However, it is not suitable for storing data items that are very small (fewer than 4K) or that need to be updated often, such as user passwords or status indicators. You can store frequently changing data in a key-value store or a relational database. If you need to analyze this data with Disco, you can dump a snapshot of the full database to DDFS, for instance, to update your user models every night. DDFS is horizontally scalable. New nodes can be added to the storage cluster on the fly, using the Disco web UI. All heavy IO on bulk data is distributed, so there are no bottlenecks limiting the amount of data that DDFS can handle. Only metadata is handled centrally, ensuring that it is kept consistent all the time. DDFS is designed to operate on commodity hardware. Fault-tolerance and high availability are ensured by K-way replication of both data and metadata, so the system tolerates K-1 simultaneous hardware failures without interruptions. DDFS stores data and metadata on normal local filesystems, such as ext3 or xfs , so even under a catastrophic failure data is recoverable using standard tools. DDFS operates on two concepts: Blobs and Tags. Blobs are arbitrary objects (files) that have been pushed to DDFS. They are distributed to storage nodes and stored on their local filesystems. Multiple copies or replicas are stored for each blob. Tags contain metadata about blobs. Most importantly, a tag contains a list of URLs (one for each replica) that refer to blobs that have been assigned this tag. Tag may also contain links to other tags. It may also include user-defined metadata. The next section describes the role of tags and blobs in more detail. It also shows how they relate to the five main tasks of DDFS, data distribution, replication, persistence, addressing and access. Consider that you have a log file containing data of a single day. For DDFS, this is a blob. When you push the blob to DDFS using DDFS APIs, a DDFS client distributes the blob to K nodes. By default, K is 3, so you get three identical replicas of the blob. DDFS and Disco can utilize any of the replicas, in case some of them are unavailable due to disk or server failure. DDFS ensures that you will always have K replicas, even if disks fail, by re-replicating blobs if needed. This guarantees that your data is truly persistent. Even persistent data is not very valuable if it cannot be accessed easily. The blobs distributed above are stored on three random nodes. To be able to use them efficiently, metadata storing addresses of the blobs is needed. DDFS uses tags for this purpose. The green tag allows you to query data behind data:log:website using DDFS APIs and retrieve a tag object that contains URLs to the blobs. You can access the blobs using their URLs over HTTP as usual, or give the list to Disco to be used as inputs for a Map/Reduce job. Naturally metadata should not be lost under any circumstances, so tags are replicated and distributed to many nodes similarly to blobs. Each blob must have at least one tag linking to it. Otherwise the blob is practically unaccessible or orphaned. Orphaned blobs are eventually deleted by the garbage collector. Correspondingly, if you want to delete a set of blobs from DDFS, you must delete all links (or tags) referencing the blobs which makes them orphaned and subject to eventual removal. 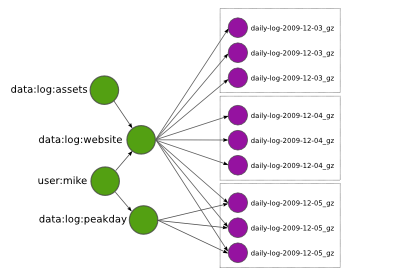 Eventually you want to add more daily logs (blobs) under the tag data:log:website . Each daily log is replicated separately, so the tag ends up containing many replication sets, that is, lists of URLs that pointing at replicas of a blob. Replications sets are represented by dotted boxes above. DDFS allows tags to reference other tags. This is a very powerful feature which makes it possible to implement tag hierarchies and graphs. For instance, the tag user:mike above links to all tags owned by Mike. DDFS APIs provides functions to traverse the tag graph, so it is straightforward to retrieve all tags and blobs owned by Mike. Tags may also reference overlapping sets of blobs, as in data:log:peakday above. This feature is useful if you want to provide many alternative views to the same data. DDFS is designed to scale to millions of tags, so you can use them without hesitation. Tags also support a token-based authorization mechanism to control read and write access. If a write-token is specified for a tag, all operations that wish to modify the tag will need to provide this write-token. Without this token, any write operation will return an “unauthorized” error. Similarly, a read-token can be used to control accesses that read the tag. Read and write tokens can be independently specified. When a token is specified for an operation that creates a new tag, that token becomes the new tag’s read and write token. This allows the atomic creation of access-controlled tags. In addition to being a container of metadata about blobs, a tag can also contain a limited number of user-defined attributes, each with a name and a string value. DDFS is embedded in Disco, hence the architecture diagram above closely resembles that of Disco (see Technical Overview). DDFS is currently coordinated by a single master node, similar to Disco itself. This choice was motivated by the ease of implementation and robustness, following experiences of the first version of the Google filesystem. As no data is stored on the master node, it is not a single point of failure with respect to data persistence. It mainly acts as a lock server, ensuring atomicity of metadata operations. Each storage node contains a number of disks or volumes ( vol0..volN ), assigned to DDFS by mounting them under DDFS_DATA/vol0 ... DDFS_DATA/volN (see DDFS_DATA). On each volume, DDFS creates two directories, tag and blob, for storing tags and blobs, respectively. DDFS monitors available disk space on each volume on regular intervals for load balancing. New blobs are stored to the least loaded volumes. Each storage node maintains a cache of all tags stored on the node. When the master node receives a request accessing a yet unseen tag, it queries the storage nodes to find all replicas of the tag. Thanks to the cache, this operation is reasonably fast. Similarly, if the master node crashes and restarts, re-populating the master cache takes only some seconds. All tag-related operations are handled by the master, to ensure their atomicity and consistency. The client may push new blobs to DDFS by first requesting a set of URLs for the desired number of replicas from the master. After receiving the URLs, the client can push the blobs individually to the designated URLs using HTTP PUT requests. After pushing all replicas successfully to storage nodes, the client can tag the blobs by making a tag request to the master with a list of URLs to the newly created blobs. If the client fails to push all K replicas to storage nodes, it can request a new set of URLs from the master, excluding the failed nodes. This approach is enabled by default in the DDFS Python API. The client can also decide to accept only M replicas, where M < K, if this is sufficient for the application. If the master detects that a node has become unresponsive, it is automatically blacklisted and dropped from subsequent queries. Thanks to replicated data and metadata, this does not result in any data loss. A regular garbage collection process makes sure that the required number of replicas is maintained, orphaned blobs are deleted and deleted tags are eventually removed from the system. The desired number of replicas is defined in the configuration file, see disco.settings for details. Blobs can be accessed either over HTTP, using DDFS’s built-in web server on each storage node, or directly on local disk. The latter feature is heavily utilized by Disco, which prefers to run tasks on the nodes where data is physically stored, to minimize network traffic. The token-based authorization scheme is implemented using the basic access authentication scheme of HTTP, as described in RFC 2617. DDFS can be configured using the normal Disco settings file. See disco.settings. DDFS can be used either through the native Web API or with a Python module, disco.ddfs, which hides the Web API behind Python functions. We assume below that the Disco master can be found at http://disco:8989. All responses by the Web API are encoded in JSON. Requests PUT URLs for a new blob. The blob is given a prefix BLOB. You can use the same prefix for any number of blobs, each call to new_blob generates a new version of the blob. BLOB must match the character class [A-Za-z0-9_\-@:]+. Optionally, you can request URLs for N replicas. However, currently DDFS only guarantees that the minimum number of replicas (DDFS_BLOB_REPLICAS) specified in the settings file is maintained. You can also specify a list of nodes, NODE1 etc., to exclude from the returned list of URLs. Returns a list of URLs on storage nodes where the blob can be pushed using HTTP PUT requests. Appends a list of URLs or replication sets to a tag TAG. If TAG doesn’t exist, it is created. TAG must match the character class [A-Za-z0-9_\-@:]+ (same as with BLOB above). which lists the replication sets to be added to the tag. to add links to existing tags. Returns a list of tag URLs. Similar to POST tag above but replaces the existing list of URLs instead of appending URLs to it. The request follows the same format as POST tag. Delete the tag TAG. Note that blobs referenced by the tag are removed only when all references to the blobs are removed. If several tags link to the blobs, deleting a single tag does not affect the blobs. Returns all tags stored in DDFS. As the returned list of tags can be potentially really long, tags can be filtered by prefix. Sets the ATTR attribute of the tag TAG to a value VAL, where VAL is the request body. If the attribute did not exist, it is created; if it did exist, its value is overwritten. ATTR must match the character class [A-Za-z0-9_\-@:]+, while VAL should be a UTF8 string. Retrieves the value of the ATTR attribute of the tag TAG. The value is returned in the request body. Deletes the ATTR attribute of the tag TAG. No error is returned if the tag does not possess the attribute ATTR. where “dG9rZW46VE9LRU4=” is the base64 encoding of “token:TOKEN”. Tokens are stored in tags as attributes in a separate ddfs: namespace; i.e. the read-token is stored as the ddfs:read-token attribute of the tag, while the write-token is the ddfs:write-token attribute. Hence, the above-described calls to get, set, and delete attributes can also be used to perform the corresponding operations on a tag’s read and write tokens. This section provides information about DDFS internals, supplementing comments in the source code. This discussion is mainly interesting to developers and advanced users of DDFS and Disco. As one might gather from the sections above, metadata (tag) operations are the central core of DDFS, mainly due to their transactional nature. Another non-trivial part of DDFS is re-replication and garbage collection of tags and blobs. These issues are discussed in more detail below. Operations on blobs are reasonably simple. The client is responsible for pushing data to storage nodes, using HTTP PUT requests. new_blob returns a list of URLs, based on the available disk space, to which the blob data can be PUT. A node receiving data via a PUT first creates a temporary !partial file into which the blob is received, and then renames the file into the blobname on successful completion. Getting a blob is just a matter of making a normal HTTP GET request. Tags are the only mutable data type in DDFS. Each tag update creates a new version of the tag; the latest version of the tag is used to get the current contents of the tag. Updating data in a distributed system is a non-trivial task. Classical solutions include centralized lock servers, various methods based on eventual consistency and consensus protocols such as Paxos. Currently DDFS takes the first centralized approach, which is straightforward to implement in a single-master architecture. All operations manipulating a tag are serialized, although many distinct tags can be processed concurrently. Serialization is achieved by handling each tag in a separate gen_server process, in ddfs/ddfs_tag.erl (tag server). Tag servers are instantiated on demand basis, and killed after a period of inactivity. Together, tag servers implement the master cache. To get a tag, tag server queries all storage nodes to find all versions of the tag (see ddfs/ddfs_tag:get_tagdata()). From the list of all available versions, it finds replicas of the latest tag version, chooses one of them randomly, and retrieves the tag data. It is not safe to get tag data if more than K - 1 nodes are unavailable, as in this case not all versions of the tag might be available. After the tag data is received, it is manipulated depending on the requested operation (GET, POST, PUT). After this, an updated version of the tag is committed to DDFS. This is a critical operation, to ensure consistency of metadata. Send the tag data to the chosen nodes, using a temporary filename. If the operation fails on a node, choose another node and retry. If all nodes fail before K replicas are written, abort. Once K temporary replicas are written successfully, make a call to rename temporary replicas to final replicas. If rename on any of the nodes succeed, the transaction succeeds, otherwise aborts. All message passing between the storage nodes and the master is limited by a timeout. Note that it is possible, under exceptional circumstances, that less than K replicas are written due to lack of rollback functionality in the last step. However, the client is informed about the number of replicas written, so it can safely reissue the tag request, if it notices an insufficient number of replicas. In any case, garbage collection process will recreate the missing replicas eventually. Deleting a tag is a non-trivial operation. Obviously deleting just the newest version of the tag is insufficient, as this would merely resurface a previous version. Deleting all versions of the tag is not very robust, as it is very likely that a temporarily unavailable node might contain a version of the tag, which would resurface once the node becomes available again. DDFS uses a special tag (metatag) +deleted (inaccessible to the user due to the plus sign), to list deleted tags. Each tag operation checks whether the requested tag exists on this list, to hide deleted tags from the user. Actual deletion is handled by garbage collector in ddfs/ddfs_gc_main:process_deleted(). The deleted tag is kept on the +deleted list until all known versions of the tag have been garbage collected, and a sufficient quarantine period has passed since the last seen version, to ensure that all nodes which might be temporarily unavailable have been restarted. Due to this mechanism, it is critical that no node stays unavailable for more than ?DELETED_TAG_EXPIRES (see ddfs/config.hrl) days before restarting. The period is currently one month. Remove leftover !partial. files (from failed PUT operations). Remove orphaned tags (old versions and deleted tags). Remove orphaned blobs (blobs not referred by any tag). Deleted old deleted tags from the +deleted metatag. Re-replicate blobs that do not have enough replicas. Update tags that contain blobs that were re-replicated, and/or re-replicate tags that don’t have enough replicas. Garbage collection and re-replication are documented at the beginning of ddfs/ddfs_gc_main.erl. They are performed only when the cluster is in a safe state with respect to Fault tolerance, i.e. there are fewer than K failed nodes in the cluster. DDFS piggybacks on Disco on fault-tolerance. It relies on Disco’s node_mon.erl to monitor availability of nodes, and to blacklist unavailable nodes. Currently many operations are set to fail if more than K - 1 nodes are down at the same time. Given K-way replication, this policy gives a good guarantee that the returned data is always consistent. However, in a large cluster (say, more than 100 nodes), it is quite possible to have more than two nodes down (with the default 3-way replication) at any point of time. Increasing K when the cluster grows is not a good option, as this would be wasteful and it would increase latencies unnecessarily. One possible solution to this issue is to restrict node operations to a subset of nodes instead of all of them. This would mean that the K - 1 limit of failed nodes is imposed on a fixed subset of nodes, which is a very reasonable assumption on a cluster of any size. The node space could be partitioned using a consistent hashing mechanism, which could be integrated to ddfs/ddfs_tag.erl without major changes in the overall architecture of DDFS.